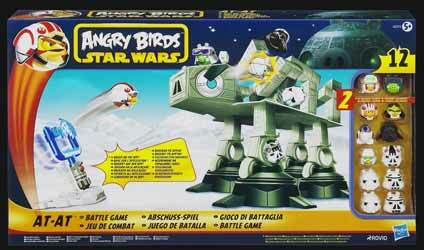 Angry Birds Star Wars: AT-AT Battle Game is one of the bigger playsets in the Angry Birds Star Wars range of interactive toys. Hasbro attempts to bring all the fun of the online game / app to the traditional toy market, and with great success. 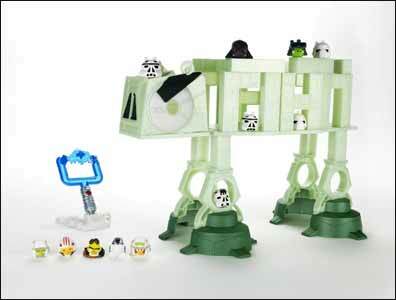 This playset is quite easy to put together, by balancing the plastic bricks to create a destructible AT-AT vehicle. Then, simply pop the evil Empire Angry Birds into random places within the bricks, and fire your rebel Angry Birds with the lightsaber launcher. I did have a couple of issues with this toy. Firstly, once constructed it's impossible to put the AT-AT head back in the box, which seems a bit of a design flaw as you can't pack everything away to be played with at a later date. And secondly, I really do think these toys are way over priced. I must be out of touch, but I thought £35 was a little too much to be charging for what is essentially lumps of plastic. There also seems to be quite a bit of confusion about the RRP with some online stores stating that the recommended selling price is £49.99. It's expensive enough at £34.99, so the fact that the cheapest online UK price I've seen it for is £34.99 is a bit of a swizz. Still, if money is no object, then this is an enjoyable set that allows you to construct and then destroy an AT-AT vehicle - or you can build anything your imagination can conjure up and then knock it down again.